This guide is a part of the “Introduction to Bulk” Series - for maximum learning, please read all the guides in the series! To view the whole series, go here! Bulk edits in SureDone are made using .CSV spreadsheets, these files can be opened in almost any spreadsheet application, such as Excel or Google Sheets. This guide will give you the basics you need to set up your spreadsheet for SureDone. Note: our Examples are using the Microsoft Excel for Mac 2011, things may be located in a slightly different location on your application. The file is organized in a series of columns, which represent fields in SureDone, and rows, which represent items in SureDone. The first row are the headers - this tells the system what fields you will be updating with the values in each column. In the below example, column C will hold all of your “stock” values for the items in this spreadsheet. The action - this must be the first column (A) - it tells the system what action to perform. Edit - edits the products with the data provided in the uploaded spreadsheet. Relist - this will take the products and relist them to your active channels. If a product is already listed on some channels, it will act as an update for those channels. Start - adds products to your inventory as a draft. It will not push to any marketplace. Delete - deletes the product from all channels AND the SureDone database forever, this cannot be undone. The identifier - this must be the second column. It tells the system which product to perform the action on. After these two, you can have as many headers or as few headers as you’d like. You should only upload headers you are using for that specific upload (e.g. if you are uploading the price & stock there - is no reason to include the title header. Every field in SureDone has a corresponding bulk header and the order is not important as long as the action is first and the identifier is second. You can download a file with the most common headers here. Each row in your bulk upload file represents a product. The system checks column A for the action and then checks column B to know which product this line represents. It then applies all of the data in the following cells to the fields listed in the header row. In the example below, you will see us editing 3 different products with their price and stock. It’s important that you only have a product on your spreadsheet once, putting the same product on the sheet twice will cause problems, with the second instance overwriting any changes by the first. 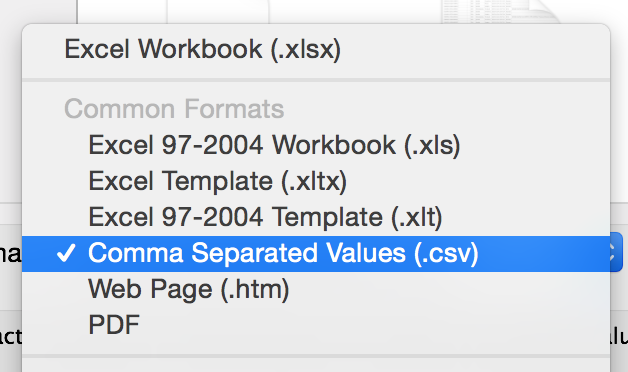 Make sure that the file you upload is a .csv (Comma Separated Values) spreadsheet. If the file is already in another format, you can do this by selecting File > “Save As…"
If you upload an .xlsx, .txt, or other file, you will receive an error "Upload Failed: Identifier is invalid” because the Bulk Uploader won’t be able to read it. Now that you know the basics about how Bulk Files are made, Click Here to learn how to export data out of SureDone in bulk.